Currently, the center is staffed by ten tutors: three English graduate students, one TESOL tutor (Teaching English to Speakers of Other Languages), and six science tutors. All of the science tutors are trained through the URI SciWrite Program, and some are National Science Foundation Fellows. All of the science tutors work in the center for course credit as part of the Graduate Certificate in Science Writing and Rhetoric. Besides tutoring, the GWC offers other services including Thesis/Dissertation Abstract Workshops and the popular Brown Bag Writing Group (BBWG), which gives graduate students three uninterrupted hours of writing time while also having a tutor on hand should assistance be needed. The BBWG meets bi-weekly in Fogarty Hall, Room 103. Ashton revealed that they are hoping to make the BBWG weekly next year. Other recent workshops offered include Managing Your Online Research and Teaching Identity, which took place on Friday, February 7th. Grad students will be excited to learn that the GWC’s popular Writing Bootcamps will be back this spring. Events often include free coffee and snacks. Besides tutoring and workshops, Ashton and her staff are also available to conduct classroom visits. The GWC had a table at the academic summit, putting out flyers which helped garner interest. Ashton explained, “We’ve reached out to some classes, but faculty have also reached out to us. We had a recent visit at the new nursing building in Providence.” Some faculty require their students to visit due to the value of the center. “Last semester we had appointments from 30 different academic programs with 107 unique clients from fields including Biology, Environmental Science, Accounting, Nutrition, Food Services, and English,” Ashton indicated. So, what can a grad student expect when they arrive for their appointment at the GWC? “When you come we focus on higher order concerns—organization, audience, global issues, even brainstorming,” said Foley-Schramm. Personally, Ashton uses questioning as a way to break into what the client may need. “We’re trying to help our colleagues and future graduates become better writers,” she explained. Some students view a writing center as a place for “bad writers,” but the GWC is a place to go to talk about your research, receive feedback before submitting papers to professors or for publication. “It’s another tool in your arsenal—it’s what you make of it,” said Ashton. Writing centers in general often have a stigma attached. 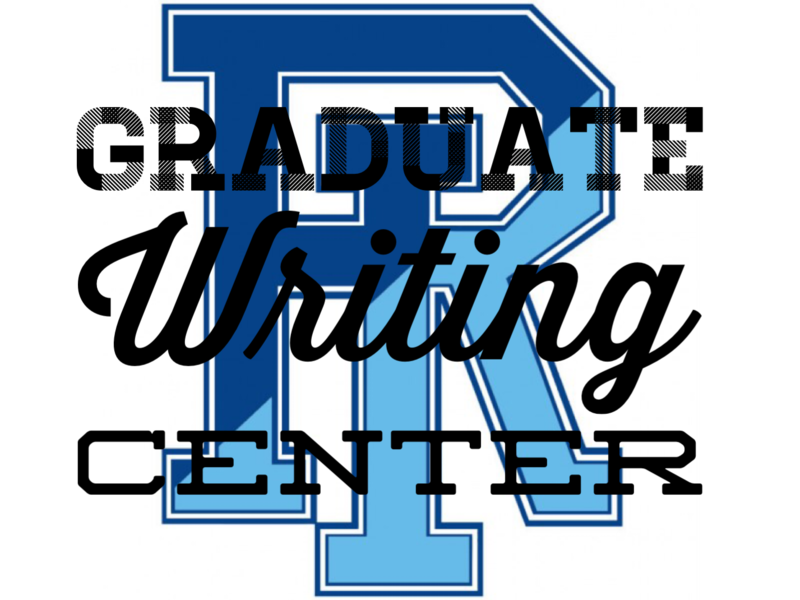 “It’s not writing remediation,” says Damiano, and here, Ashton completes his sentence: “it’s part of being a good writer, engaging others with your work.” The URI GWC is a great place with great services. The GWC is currently open Monday 10am-6pm, Tuesday-Thursday 10 am- 7 pm, and Friday 10-3 pm. They are open through July 18th for both the spring semester and summer sessions. Walk-ins are seen based on tutor availability, but you can book an appointment (highly recommended) here. Heather J. Macpherson is assistant editor of the URI Graduate Blog, and PhD student in Literature focusing on Creative Nonfiction, the History of the Essay and Animal Studies. She has work forthcoming in the Bennington Review, 580 Split, and Blueline.